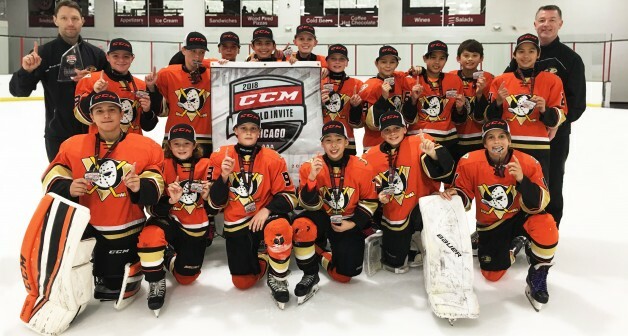 The Anaheim Jr. Ducks’ Pee Wee AAA team owned Chicago for a day. The 2006 birth year squad won three consecutive playoff games against teams from the Windy City to win the SuperTacks Division at the CCM World Invite in Chicago on Nov. 4. The tournament included 526 teams, including 24 in the Jr. Ducks’ division. The Jr. Ducks capped their title run with three victories in a little more than eight hours and finished with a plus-20 goal differential. “That was a challenge, having to beat those three Chicago teams all in one day,” Jr. Ducks coach Eugene Kabanets said. The Jr. Ducks started their day at 7:40 a.m. with a 4-0 quarterfinal win against the top-ranked Chicago Young Americans. Less than four hours later, the Jr. Ducks blanked Team Illinois 2-0, in the semifinals. That set up a final against Chicago Fury at 3 p.m., and the Jr. Ducks took that, 5-4. “I believe our strength was we all played well as a team,” Kabanets said. “We didn’t have one or two players who dominated. Goaltender Olivier Caballero was selected the MVP of the SuperTacks Division. He and fellow goalie Rudy Arishin combined for three shutouts and held foes to one goal in two other games. The team also included defensemen Oliver Clarke, Max Holland, Liam McGuern, Kai Mencel, Andrew O’Sullivan and Brendan Vincent; forwards Lewis Beddow, Nicholas Christianson, Trevor Connelly, Memphis Day, Tyler Kedzo, Logan Mazzella, Chase Stefanek and Aidan Yi. Kabanets was assisted by Alex Vasilevski, Scott Connelly, Tom O’Sullivan and Albert Yi. Kristin O’Sullivan is the team’s manager. This also marks the second time a Jr. Ducks team has won a title at the World Invite in Chicago. The club’s 2001 team won a championship as Squirts in 2010.